Does style have anything to do with what I mean to say? Is my style-anyone's style-an integral part of the work's meaning or does it just serve to individuate me from other artists and them from me? 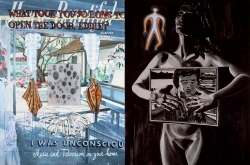 Previous exhibition, David Salle, "small paintings"
David Salle has taken the device of pastiche, which is central to modern art, and made it both the form and content of his work. 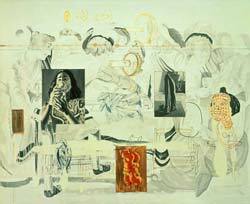 His canvases are populated with dramatic images lifted from sources as various as his own black-and-white photographs, eighteenth through twentieth century French and American painting, print advertising from the fifties, and "how to draw" manuals. 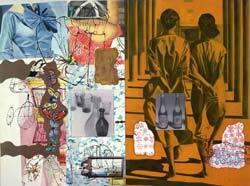 Much has been written since the early '80's about David Salle and his style of juxtaposition. 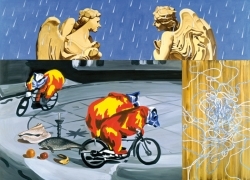 The images appear to establish relationships of meaning, but the closer one gets the less one sees. 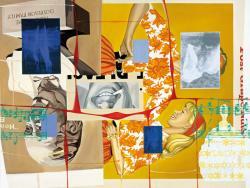 David Salle is one of the most significant American artists to have emerged in the early 1980s. 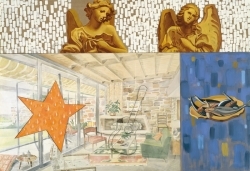 His unique style of painting was influential in the international revival of large-scale, figurative painting that characterized much of the artistic production of this decade. 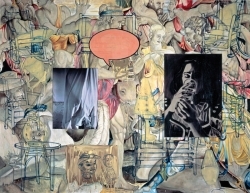 When David Salle emerged on the art scene in the early 1980s, his often oblique work was set squarely within the critical definition of postmodernism by virtue of its art-historical references and ambiguous combinations of original and appropriated imagery from both high and low traditions. About the bananas, is this a new image or is it me that hasn't seen the bananas before? ROBERT ROSENBLUM: We should of course begin with the '80s. But I'm interested in what happened to you before the curtain went up. 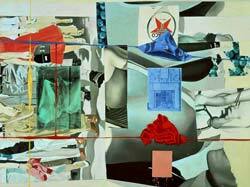 DAVID SALLE: I came to New York in 1975 after CalArts. I floundered around for a few years, happily. I loved being in New York. RR: Your signature style is always so clear in the work we know that it's hard to imagine what led up to it. What was it like before 1980?